My name is Amelia Gray. I'm a cemetery restorer who sees ghosts. In order to protect myself from the parasitic nature of the dead, I've always held fast to these rules passed down from my father…until now. Detective John Devlin needs my help to find a killer, but he is haunted by ghosts who shadow his every move. To warn him would be to invite them into my life. I've vowed to keep my distance, but the pull of his magnetism grows ever stronger even as the headstone symbols lead me closer to truth and to the gossamer veil that separates this world from the next. This is the end? Noooooo!! With 11 missing women to find and six high-profile burglary cases to solve, the last thing Detective Nathan McNamara needs in his life is one more complication. And that's exactly what his recent one-night stand is becoming - complicated. With his heinous lieutenant breathing down his neck for answers and his accidental girlfriend dropping hints for a commitment, Nathan is realizing that his career and his bachelor status are both on the line. Ellie Jordan's job is to catch and remove unwanted ghosts. Part detective, part paranormal exterminator, Ellie operates out of Savannah, Georgia - the most haunted city in the United States. When a family contacts her to deal with a disturbing presence in the old mansion they've recently purchased, Ellie first believes it to be a typical, by-the-book specter, a residual haunting by a restless spirit. Instead she finds herself confronting an evil that is older and more powerful than she'd ever expected. Sarah Piper’s lonely, threadbare existence changes when her temporary-work agency sends her to assist a ghost hunter. 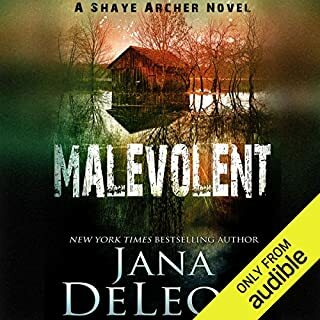 Alistair Gellis - rich, handsome, scarred by World War I, and obsessed with ghosts - has been summoned to investigate the spirit of 19-year-old maid Maddy Clare, who haunts the barn where she committed suicide. Since Maddy hated men in life, it is Sarah’s task to confront her in death. Soon Sarah is caught up in a desperate struggle, for Maddy’s ghost is real, she is angry, and she has powers that defy all reason. My name is Amelia Gray. They call me The Graveyard Queen. I've been commissioned to restore an old cemetery in Asher Falls, South Carolina, but I'm coming to think I have another purpose here. Why is there a cemetery at the bottom of Bell Lake? Why am I drawn time and again to a hidden grave I've discovered in the woods? Something is eating away at the soul of this town - this withering kingdom - and it will only be restored if I can uncover the truth. 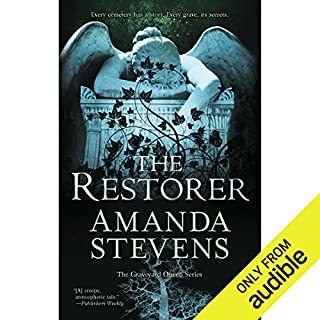 ©2012 Amanda Stevens (P)2012 Audible, Inc.
Really good second book in the Graveyard Queen series. I really like how the story unfolds for Amelia, how she discovers the towns secrets and how they effect her. At times it's a little predictable but getting there is a treat. Amelia and Thane are interesting and likeable and finding out how they've been manipulated is a very good read. Khristine Hvam does a great narration but then I knew that from the Jane Yellowrock books she also narrates. I don't know a thing about a southern accent but I like to think that it's as Khristine represents it. In these books the accent makes the story all the creepier. I certainly hope they stick with her for the narration of the third book, The Prophet. Hopefully it will show up on audible soon. 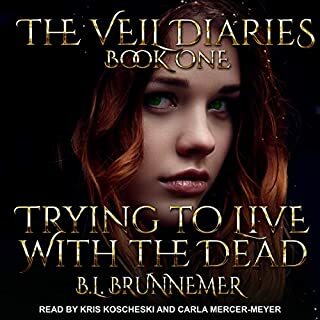 Good second book in the series which sees another graveyard needing restoring by Amelia but this one has some creepy surprises in store for her. Along with the plot, which is dark and creepy, it also tells us more of Amelia's beginnings and thus why she can see ghosts. However, there just wasn't enough romance in it for me to enjoy fully. Worth my credit? 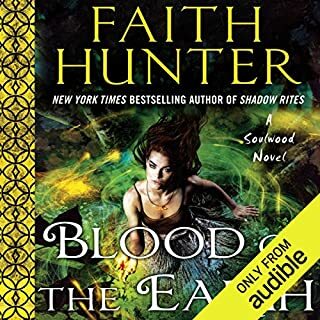 Mmmm again, 50/50 I will continue with this series now I am 2 books invested into it but if I hadn't ever started the series then it would be a no. Amelia Gray is on a new assignment in this book, she was commissioned to restore a cemetery in Asher Falls, South Carolina. Something about this assignment is suspicious. There is a lot of mystery to the town and the townspeople are very reticent to outsiders. She makes a handful of friends, most importantly Thane Asher and a stray dog she adopts and names Angus. The biggest mystery she uncovers is her past connection to this town and we learn she was lured here because of her past. This book was plot-driven and the romance was collateral. I was looking for a replacement for Devlin (her guy in book 1) and it didn’t have enough of real romance to make me happy. It is a well written book though. 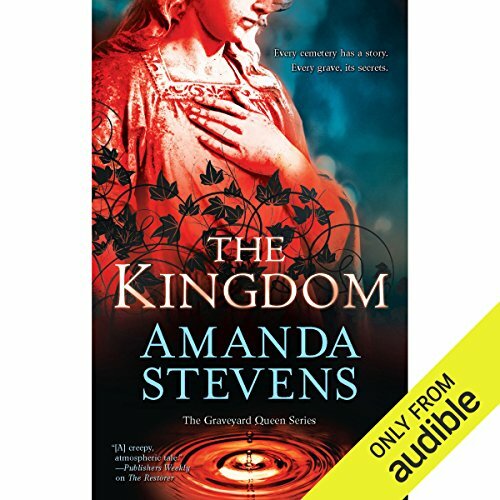 'The Kingdom' is the second book of Amanda Steven's 'Graveyard Queen' series. This gothic novel continues the story of Amelia Grey who restores old southern graveyards. She also has the ability to see ghosts. 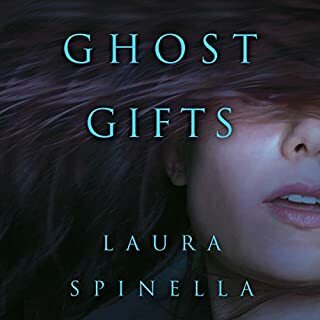 In this book, Amelia finds out the truth about this ability as she works to restore the old cemetery in Asher Falls, South Carolina which is in the foothills of the Blue Ridge Mountains. This story brought chills to my spine. 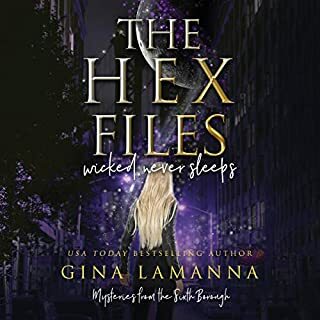 The secrets of the spooky small town, the frightened townspeople that inhabit this town, the back story of the previous book in this series work together well to create the eerie feelings necessary to bring my mind to such a place. For the most part the continuity, the ability of this author to get me to suspend disbelief is done very well but occasionally it just barely missed causing me to have questions; overall, though, I thought this story engrossing and believable. i recommend this book for those who enjoy reading horror and suspense. Good story continues from "The Restorer"
Should read "The Restorer" first, then this book, then "The Prophet". If you like the first book, you'll like all three. All of them are a little spooky, as you would expect, if the main character can see the spirits of the lingering dead. I enjoyed them all, and hope the series continues. the narrator good, kept the story interesting. the story, characters seemed to follow the same outline as the first book. Because I wasn't sold on this series after the first book. I enjoyed the first book but it was a bit slow. This book had a better place and better plot IMO. I love Kristen Hvam. She does great southern voices. And great make and female voices. Overall if the rest of the series of on par with this book I'll be reading them all! Lord, have mercy and get this woman a thesaurus! I stayed with the book because the plot hooked me; and I have too many loose ends in real life to leave this unfinished. Great fiction this is not, however I tried to justify it. Like Bollywood, the entire book is seething with sexual tension and leaves you hanging, unfulfilled. I want to listen to it over and over. It was wonderful! I highly suggest it.